Last year, Tom Cannavan reported on the fascinating wines of Western Slovenia, close to the Italian border. In this follow-up report, Caroline Gilby MW heads east, towards the Austrian and Hungarian borders. 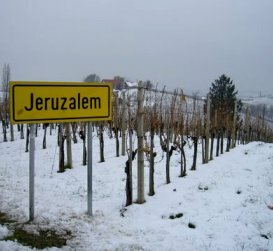 Out for a morning run round snowbound vineyards one day in late November, I found myself humming that immortal line from a Genesis album “take me to the new Jerusalem.” Perhaps not so surprising as Jeruzalem was exactly where I was. I doubt that the crusaders who named this picture postcard, hill-top village, would see much resemblance between old and new Jerusalem today. Slovenia’s Jeruzalem is richly verdant in summer, and dramatic under its snowy blanket in winter, with vines clinging to just about every hillside.This was my second visit to Slovenia this year, this time to look at wineries in Stajerska in the east of the country, where over 10,000 ha of Slovenia’s registered 17,000 ha are to be found (aerial surveys show a bit of mismatch with up to 22,000ha of vines). Slovenia doesn’t have a north-south divide so much as an east-west one. This is notable in both the grape varieties, and wine styles produced, as well as in food and culture. Eastern Slovenia has definite Austrian influences, unlike the west which shares a much more Italian outlook. Grapes grown here include Laški Rizling (once the backbone of Yugoslavia’s exports) as well as Riesling itself (called Renski Riesling), Traminer, Muscat (usually Rumeni or yellow Muscat), Pinot Gris (Sivi Pinot) and Šipon (Slovenia’s name for Hungary’s Furmint). The story goes is that during the Napoleonic wars, the wine was offered to French officers who enthusiastically commented “(C’est ci Bon! ).It’s not a region for serious reds, as most would have little hope of ripening, though there are pockets of Pinot Noir and Blaufrankisch (or Modra Frankinja). Slovenians are among Europe’s heaviest drinkers, getting through over 50 litres per head and probably more if the grey market is included. However, the local taste is for a pale red called Cviček. This is a blend of at least 4 varieties, low in alcohol and fiercely acidic – but locals still get through as much as 2 litres a day. The climate is much more continental than the Mediterranean west. It can reach 40°C in summer but winter temperatures are regularly as low as -20°C. This gives a clue as to the wines the region is most proud of – its intensely sweet and luscious ice-wines and “Trockenbeeranauslese” (look for Ledeno vino and Jagodni Izbor on the label). The country’s best producer of these wines is the family business of PraVino, where three generations are still involved. PraVino’s Stanko Čurin is quite frail nowadays but is a real hero to the wine industry here. He was the first to start bottling wine privately, something that was scandalous to the totalitarian socialist regime in the 1970s, and in 1980s he had to smuggle vats from Austria to develop his own wine production. PraVino’s ice wines from Šipon (shown left, hanging in winter snows) and from the often lowly Laški Rizling are simply stunning; and it was no mean feat for the Šipon to beat a line up of excellent Tokaji for two years running at the Decanter World Wine Awards.These are not cheap wines, with tiny yields of just 100ml per vine, as well as the dedication involved in hand-picking frozen grapes at -14°C in well into January. Protecting the precious crop from starlings until then is clearly a challenge – a visit to the vineyards was peppered with the intermittent boom of a bird scarer and “screech” of a hawk played over loud speakers. Almost everyone in this region produces sweet wine in tiny amounts – clearly a labour of love and important tradition. However, with a few exceptions, most are unlikely to make it beyond Slovenia’s borders due to their often eye-wateringly high prices. Nevertheless, for a truly special occasion, wines like PraVino’s, or Dveri-Pax’s gorgeously silky Botrytis Šipon/Chardonnay, are worth seeking out. Traditionally, eastern Slovenia has largely produced semi-dry and semi-sweet wine styles. Natural acidity levels are high in this region, and sugar was a good way to balance the often searing acids in the past. Today, the region’s better producers are focussing on dry wines: partly because dry wines suit changing consumer tastes, especially in Slovenia’s burgeoning restaurant culture; and partly because viticulture and winemaking have improved. Riper fruit, produced from lower yielding vines, results in crisp, zesty, mouth- watering wines that are flavourful and elegant at their best. Alcohol levels are modest too, giving great drinkability. PraVino’s dry wines, made in 2006 for the first time in defiance of “Dad” are a revelation, while other producers from the region to look out for include Verus, Dveri-Pax, Miro Mundo, Valdhuber, Joannes, Kogl, Gaube and young Uros Valci. One thing that does need to change is the insistence of some wineries in sticking to their traditional use of large, old oak casks. These rarely add anything of benefit, especially to the region’s delicate fragrant whites and more often it seems miraculous that anything survives this treatment to be half way drinkable. If oak is used at all, it must be scrupulously clean and kept in immaculate condition. Šipon may be the local name for Hungary’s Furmint, but there’s something about the soils, climate or possibly plant material that gives the wines a distinct local style; softer and less acid than Tokaji. A group of producers have set up “Club Šipon” to raise the grape’s profile as a Slovenian speciality. 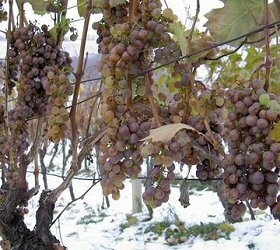 Traditionally grown for its potentially huge yields, Club Šipon producers insist on just 1.5kg per vine instead of 6-7kg, along with higher ripeness, and vinification as a dry wine. A couple of young producers doing promising things with Šipon include Miro Munda (whose modest winery is pictured left), supported by his Austrian partners, the Polz brothers. His wvines are zesty and fresh, with a Chablis-like mineral quality. As he points out “winemakers must be proud of a variety to persuade consumers to buy”. He also makes good Sauvignon Blanc, which keeps surprisingly well.Another “new kid on the block” is Verus set up by Danilo Snajder & two colleagues, who all previously worked at the former state cellar of Jeruzalem-Ormož. British MW Angela Muir is a director of this small winery, whose 2007s have lovely aromatics and fresh, crisp structure. The varietal emphasis changes slightly as you head towards Slovenia’s second city, Maribor. Here the steep slopes and deeper clay soils suit the Pinots and Chardonnay, while outcrops of schist suit Riesling and Muscat. Bostjan Protner of Joannes was the pioneer of dry wines in the Maribor area, where he makes good Riesling, Pinot Gris, decent Chardonnay and a pleasant Pinot Noir rosé. 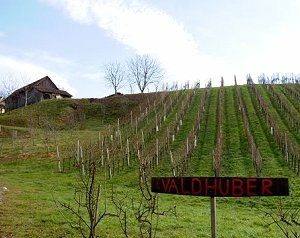 Literally within a few metres of the border with Austria’s Styria, Sauvignon Blanc does well, with Valdhuber making one of the best. Pinot Gris and Grüner Veltliner also suit the area. There’s Austrian involvement at the brand new Dveri-Pax winery, owned by Benedictine monks. The spotless winery was opened in 2007 and is a great contrast to the 300 year-old arched cellar and tasting room. 10 million Euros have gone into the winery and vineyards, and the range is impressive.Another important factor in Slovenia is the development of tourism. Ryanair now flies to Maribor which is also known for skiing and Brits buying second homes. 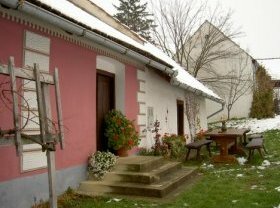 Several wineries, including Hlebec and sparkling cellar Istenic are involved in “agro-tourism” offering wine tastings, home-produced meals and even rooms. Local dishes include wonderful dry-cured ham, often served with horseradish, and fresh cheeses. Pickled turnip (similar to sauerkraut), buckwheat and beans are typical ingredients too. Pumpkin is a speciality of the area and appears in guises from soups and salads to fantastic nutty breads made with pumpkin seeds and locally produced oil. In fact, the quality of the unique cold pressed oil from Kocbek was impressive, and dark chocolate with toasted pumpkin seed was delicious.Slovenia is a thrilling country to visit, with it stunning scenery and warm welcome. Its leading producers are undoubtedly punching well above their weight in making some of the most exciting wines in central Europe. Eastern Slovenia has its own distinctive part in this rich tapestry that deserves to be better known: with its fruity, fragrant and mouth-watering dry whites and lusciously silky sweet wines.